Labelled an embarrassing white elephant after being used for the Millennium celebrations, the Dome could come into its own at a 2012 London Olympics. Although situated on the other side of the River Thames from the planned Olympic zone in the Lower Lea Valley, the Dome is just a few miles away in Greenwich. The plan is to link it to the core zone with a giant park from the north bank of the Thames to Hackney Marshes, as well as some kind of river crossing. It cost £22.9m to keep the Dome empty since July 2001 and the start of this year. 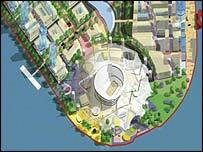 But developers are due to begin work in 2004 to transform it into a 26,000-seater sports and entertainment centre. Work could be finished by 2006, making it the ideal venue for some indoor Olympic events.